There are three general categories: refractors, reflectors and catadioptrics. 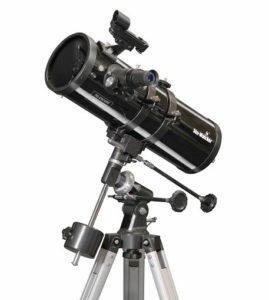 Refractors are the traditional type of telescope, with a lens at the top end of the tube, and you view at the bottom end. Reflectors have mirrors at the bottom end of the tube, and you view at the top end, looking sideways into the telescope. Catadioptrics combine the two and are basically reflectors but with a corrector plate at the top end to reduce the length of the telescope, so you get a more compact instrument. Each type has its pros and cons, and works best in a particular environment, but all will give good views of the full range of astronomical objects, as long as they are from a reputable manufacturer. Here are the pros and cons in a nutshell, but whole books could be written about each type. These range in size from the very smallest telescopes at about 30 mm aperture, used for finder telescopes and indeed binoculars, up to about 180 mm for very expensive observatory models. Their advantages are that they are low-maintenance and robust, and can give excellent contrast images. They are particularly suited to planetary observing because of the inherent good contrast, and are good for use in towns where light pollution is a bit of a problem. They can also have good definition across a wide field of view, which is good for photographing nebulae and other extended objects. Drawbacks are that they get very expensive once you go above about 120 mm aperture, and they are prone to dewing up as the lens is exposed to clear sky. In the larger sizes they can be a bit unwieldy, as they need long tripods to avoid observing positions too low to the ground. And one big problem is that they are inherently likely to suffer from false colour, known as chromatic aberration – that is, coloured fringes that are obvious around the edges of bright objects. Comparison of images of the lunar crater Pythagoras from three small telescopes of similar focal length. L-R: 80 mm Sky-Watcher ED refractor; unbranded 80 mm achromatic refractor; Bresser Skylux 70 mm achromatic refractor. You can see the chromatic aberration (false colour) clearly in the images from the two cheaper instruments, but it is absent from the ED refractor. Apart from toy telescopes at the cheap end of the market, which should be avoided like the plague even for a child’s first telescope as they are not corrected at all for false colour, the main method of correcting false colour is to use an achromatic lens. This type can work well in the more expensive instruments, but there is always some residual false colour. Today, apochromatic lenses are much more affordable than in the past, and have much improved correction to the extent that in a good instrument the false colour isn’t noticeable. This is made possible by the use of extra dispersive (ED) glass or a type of fluorite glass. But even ED refractors vary a lot, so don’t rely on the letters ED alone if you are considering one. Bear in mind also that as chromatic aberration increases as the focal length gets shorter, compact refractors (with a focal ratio or f-number lower than about 10) are more likely to suffer from false colour and are therefore less well suited to high magnifications. But large f/10 refractors tend to be unwieldy. Although you can get entry-level reflectors of 76 mm aperture, these are of limited use because the secondary mirror that brings light to the side of the tube has to be quite large and obstructs some light, so their performance is inferior to that of a similar sized refractor. But in sizes of 100 mm and above, they become increasingly good value compared the refractors as the secondary is smaller compared with the aperture. A 150 mm reflector is affordable, whereas a 150 mm refractor is much more expensive and may not perform as well. The chief advantages of reflectors are their lower cost, aperture for aperture, and their total lack of false colour. They are unlikely to dew up, as the mirror is well down inside the tube, which in the UK’s moist climate is a bonus. Their drawbacks are that the mirror can easily become dusty and require cleaning (not a trivial task) or even recoating, particularly in a poor environment such as by the sea (expensive). They are less robust than refractors, and the optics can require realigning from time to time. The open tube can suffer from swirling air within the tube, which spoils the image, and is also susceptible to nearby lights shining into the tube. Because of the secondary mirror, there is some light absorption and shadowing, so the image is less bright than with a similar-sized refractor, and fine detail lacks contrast compared with a refractor. And the outer parts of the field of view are subject to distortions such as coma, which makes stars look like small comets, though this is not noticeable unless you use wide-field eyepieces. As with refractors, the smaller the f-number, the more noticeable the distortions. However, many reflectors these days are f/6 or shorter. Despite all this, reflectors are very popular in the larger sizes. A 200 mm or 250 mm reflector is fairly affordable, and provides sufficient aperture for a large number of fainter objects, such as deep-sky objects and indeed the moons of the planets, to be seen. 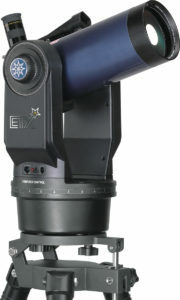 The standard design for a reflecting telescope is a Newtonian, but there are variants which are occasionally encountered, mainly the Cassegrain. There are two main types of these – the Schmidt-Cassegrain (S-C) and the Maksutov (Mak). They typically have much longer focal lengths than their tube size suggests, so they provide the potential for high magnification in a compact tube size. Their compactness is a great bonus, as the eyepiece is usually at a convenient height, even though you are observing at the bottom end of the tube. S-C telescopes are made in large numbers and are often provided on a purpose-built Go To mount, though you can also get them as tube-only (known as OTA, for optical tube assembly) for use on a mounting of your choice. 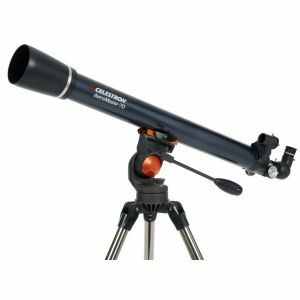 The standard sizes are 200 mm and 250 mm, though Celestron have 9.25 inch (235 mm) and 14-inch (355 mm) models that are very popular with planetary photographers. Maks are more tricky to make and are generally available in smaller sizes, such as 90 mm and 127 mm. They have long focal lengths for their size and are noted as planetary instruments, but are less suited to giving wide-field views of extended objects such as star clusters.